Thankfully the clients have gone for a white paint, which will really make the grey powder-coated aluminium frames stand out. There is still some protective black wrapping on the frames, we’ll only take this off when we give it a final clean up. 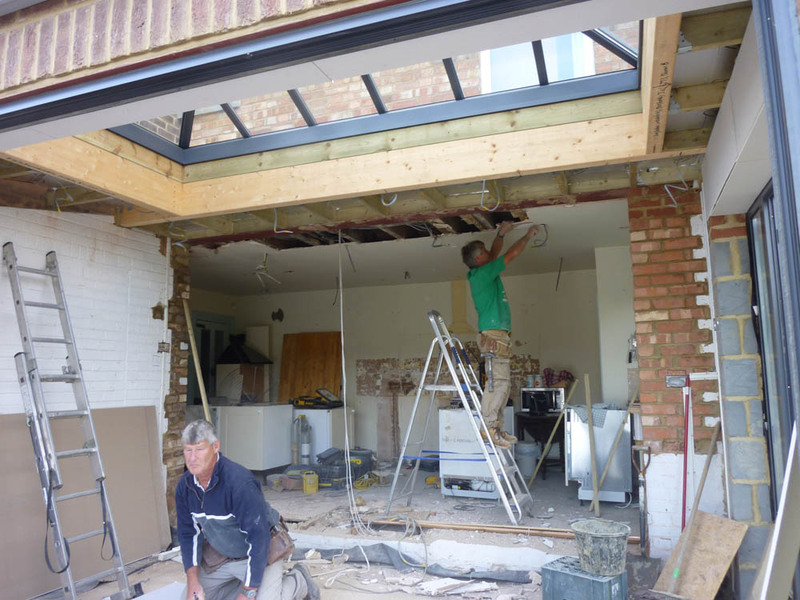 The kitchen is partially fitted, they are just waiting for the Corian work surfaces to be made, as these need to be measured for once the kitchen units are installed. 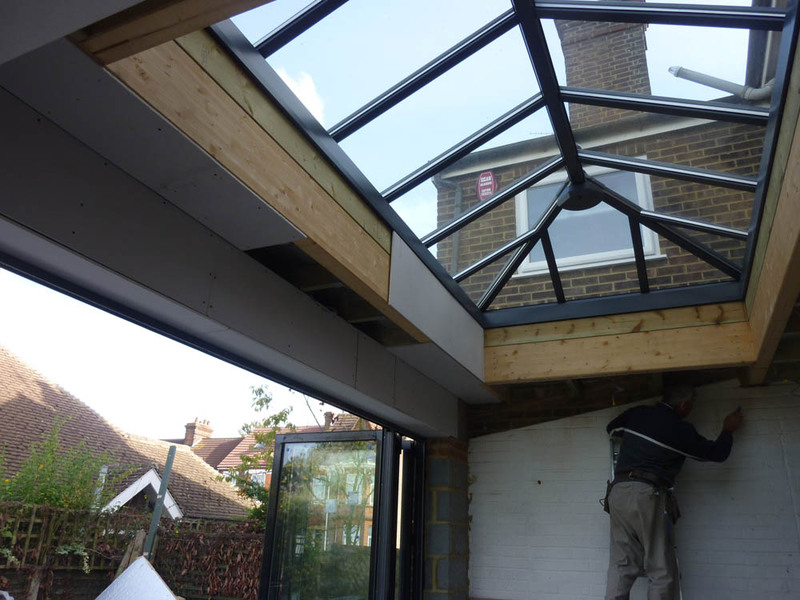 It looks like it will be quite cool, and really complement the orangery! In the mean time, we will lay the underfloor heating and the hardwood flooring. There is also some additional work for us to do in making good the existing kitchen floor, which is quite uneven. As to be expected the plasterer (Shane) has done a good job on on the ceiling considering how bad the old one was, it’s a big area and the finish is perfect. 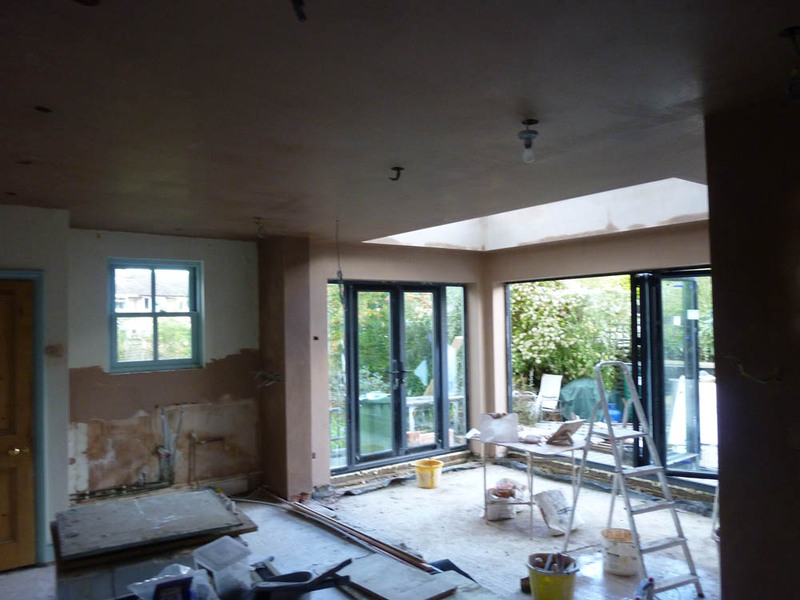 Walls and ceiling plastered, insulation down ready for screed. 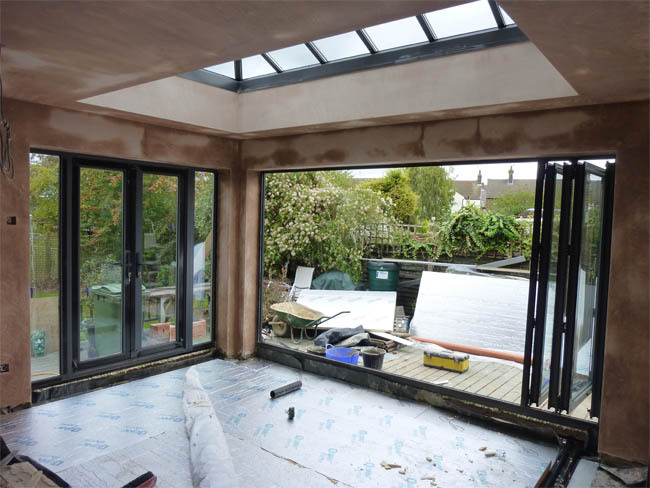 The wide opening of the bifold doors is allowing the plaster to dry quickly! Both new and old ceilings have just been plastered, looks like it’s going to be a huge space. The plasterers have done a really good job, it’s a big area and the old ceiling was all quite uneven. And they’ve kept the place relatively clean and tidy, I think plasterers can get canonised for that? The guys are fitting the plasterboard. 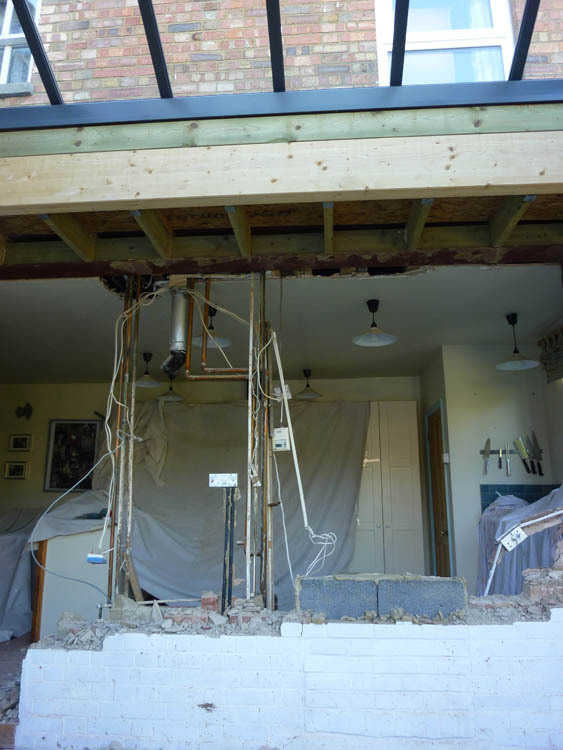 We need to strip back some of the old ceiling to plaster over the RSJ. As you can see this is hidden within the ceiling/floor space, so the new and old ceilings will run flush. Should be a huge area. The old ceiling is quite uneven, but this is down to the ceiling/floor joists being twisted and out of level. It would be a major operation to rectify this, both in terms of expense, mess and time, so the clients quite rightly will leave as is. Hopefully the plasterers can smooth it out. The wall has almost gone and the building hasn’t fallen down, which is always a good sign 😉 The steel is in place already and the new building is secure and watertight. We have dust-sheeted over the clients old kitchen units, but these are being replaced as part of the project. The entire kitchen will be redecorated, but it make everyone’s life easier to keep mess to a minimum. The pipework and cable will be re-routed, but because much of it needs to go into the floor, it will be easier to do once the wall is out of the way.